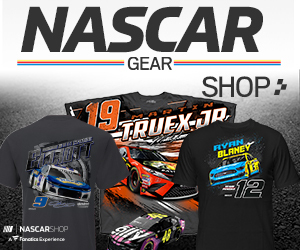 Chase Briscoe made the most of pit strategy that put him out front during Saturday’s inaugural NASCAR Xfinity Series race at the Charlotte Motor Speedway Road Course. 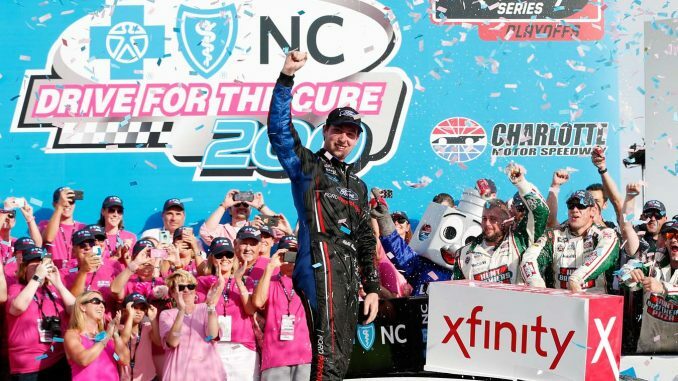 Leading the last 24 of 55 laps in the Drive for the Cure 200 at the challenging 2.28-mile, 17-turn road course—thanks to a pit stop on Lap 26, before the end of Stage 2—Briscoe held off Justin Marks after the last restart on Lap 45 and took the checkered flag 1.478 seconds ahead of Marks’ No. 42 Chip Ganassi Racing Chevrolet. 1. (9) Chase Briscoe, Ford, 55. 2. (4) Justin Marks, Chevrolet, 55. 3. (1) Austin Cindric # (P), Ford, 55. 4. (10) Ryan Preece, Toyota, 55. 5. (13) Christopher Bell # (P), Toyota, 55. 6. (7) Matt Tifft (P), Chevrolet, 55. 7. (6) Cole Custer (P), Ford, 55. 8. (14) Kaz Grala #, Ford, 55. 9. (3) Tyler Reddick # (P), Chevrolet, 55. 10. (2) Daniel Hemric (P), Chevrolet, 55. 11. (15) Ryan Reed (P), Ford, 55. 12. (16) Ross Chastain (P), Chevrolet, 55. 13. (5) Alex Labbe #, Chevrolet, 55. 14. (17) Elliott Sadler (P), Chevrolet, 55. 15. (12) Justin Allgaier (P), Chevrolet, 55. 16. (11) Ryan Truex (P), Chevrolet, 55. 17. (18) Brendan Gaughan, Chevrolet, 55. 18. (19) Jeremy Clements, Chevrolet, 55. 19. (25) Spencer Gallagher, Chevrolet, 55. 20. (23) Michael Annett, Chevrolet, 55. 21. (21) Lawson Aschenbach, Chevrolet, 55. 22. (22) Brandon Jones (P), Toyota, 55. 23. (29) Joey Gase, Chevrolet, 55. 24. (28) Josh Bilicki #, Toyota, 55. 25. (36) Garrett Smithley, Chevrolet, 55. 26. (30) Ray Black II, Chevrolet, 55. 27. (34) David Starr, Chevrolet, 55. 28. (37) Chad Finchum #, Dodge, 55. 29. (35) Spencer Boyd #, Chevrolet, 55. 30. (33) Dylan Murcott, Chevrolet, 55. 31. (40) Vinnie Miller #, Chevrolet, 52. 32. (24) Timmy Hill, Toyota, 50. 33. (26) Katherine Legge, Chevrolet, 50. 34. (8) Ty Majeski, Ford, 49. 35. (32) Bayley Currey(i), Toyota, Engine, 37. 36. (27) Ryan Sieg, Chevrolet, Suspension, 37. 37. (20) Andy Lally, Chevrolet, Accident, 34. 38. (31) Landon Cassill, Dodge, Engine, 30. 39. (39) Jeff Green, Chevrolet, Brakes, 20. 40. (38) JJ Yeley, Chevrolet, Suspension, 6. Average Speed of Race Winner: 81.267 mph. Time of Race: 01 Hrs, 32 Mins, 35 Secs. Margin of Victory: 1.478 Seconds. Caution Flags: 5 for 10 laps. Lap Leaders: A. Cindric # (P) 1-13; D. Hemric (P) 14-17; C. Briscoe 18-26; C. Bell # (P) 27-31; C. Briscoe 32-55. Leaders Summary (Driver, Times Lead, Laps Led): C. Briscoe 2 times for 33 laps; A. Cindric # (P) 1 time for 13 laps; C. Bell # (P) 1 time for 5 laps; D. Hemric (P) 1 time for 4 laps.